I see there is a sign on the old Tequila Republic (Ajijic pier) that says Pizza, Italiano & Ice Cream. Anyone been to this yet? Now its official. 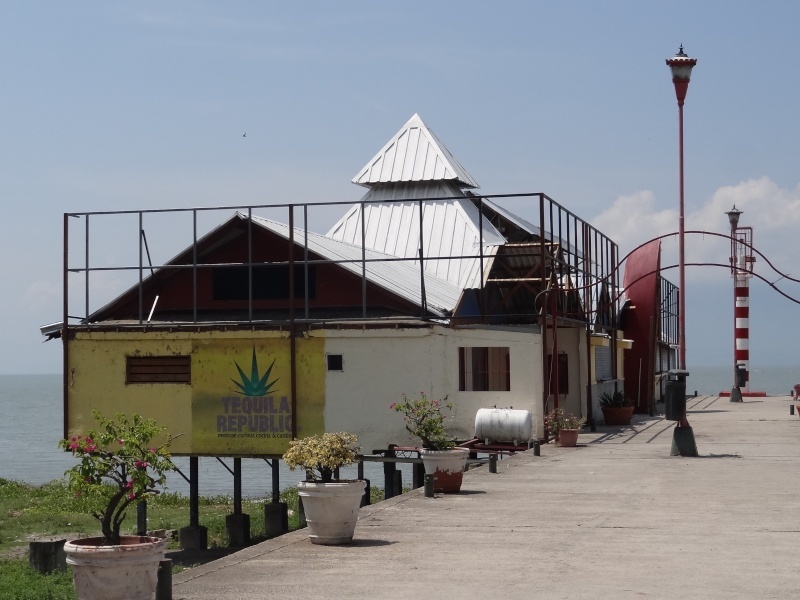 A new owner has taken over the lease at the old Tequila Republic at the end of the Ajijic pier. Construction has already began and they are beefing up the undercarriage as well. The owner (or what appeared to be the owner) said it will be a restaurant in the same vein as Tangos. I wish them all the best as it will be nice to see this eyesore fixed up and occupied. I hope they get some good live music in there too and make it more like Adelita's. That would be awesome. A perfect "sundowner" location. Good luck to 'em. Hmmmm yes it would great to see this emerge from Ajijic's past and rejuvenate what has been lost! Let us pray........that this structure isn't there for signage support ! Wow. I saw them putting up the west side….but hadn't seen the north side. That is really something. Wow again. Wow. It just gets worse. If they do a good job attaching it, the whole building will blow off the pier, and probably lie there for a few years on the “beach“. RVGRINGO wrote: If they do a good job attaching it, the whole building will blow off the pier, and probably lie there for a few years on the “beach“. A wind powered, "sail" restaurant???? That place has had bad luck from the beginning. You would think it was a no brainer to serve simple food and drinks in such a location.......but it never seems to last long. If that really is a huge all around sign..............pray for wind. LOTS of wind. I hope they realize it is the food and service that make a restaurant successful and not just having bigger signs than everyone else. Lady Otter Latté wrote: I hope they realize it is the food and service that make a restaurant successful and not just having bigger signs than everyone else. Exactly. Sitting in the best spot in Ajijic, in the location where the Old Posada used to be, with a view of the lake and easy parking, there is Maria Isabel, opened not too long ago. First, there was the daily buffet along with a sit down menu. We went and spouse got violently ill later that day. (I know, there's no way to directly connect these events) But....he had the pasta salad; I didn't. I had lukewarm-to-cool chicken tacos. Red alert on that one. Didn't go back. Then the daily buffet ended and only Sunday Brunch remained. That, too, is history. No, it's not about the signage or the hoopla or even the location. IT'S ALL ABOUT THE FOOD. Let us hope that the new place bears that in mind. I'd really like to have a sunset drink and some simple, but GOOD, food. gringal wrote: No, it's not about the signage or the hoopla or even the location. IT'S ALL ABOUT THE FOOD. A whole collection of entirely mediocre fish restaurants in Piedra Barrenada approaching San Juan Cosalá suggest otherwise. You could be right. Never eaten at any of them. I think the appeal is primarily being on the lake, for folks from Guadalajara. Now, if that translates to this current project in Ajijic...........we shall see. For me, anyway, it's All About the Food, still. It's all about the food for me too. But the quality of the food is not the measure for everyone. There are different formulas for restaurant success. I still can't get over that iron work they've put around the old restaurant building. No matter what, it'll at least be interesting and controversial! I can do with mediocre food if the ambience (and entertainment?) is good. I love to cook so when I go out it's not usually for the food it's for the experience. Definitely plastic wrap style signage support. Ugh. However I would just like the view over the lake, a drink and some halfway decent nibbles. And my last request would be NO music. Not everyone like Beatles and that other 60s stuff which we did not grow up with. Some national romantica music playing softly in thebackground like Mexico musak would be okay...but "penny lane" and "eleanor rigby" and "stairway to heaven" on a loop every 20 minutes is revolting. The big sign will be an eyesore. Oops! Nobody got a permit, project has been put on hold. This article also explains the history of this concession. Ms.Thang wrote: Oops! Nobody got a permit, project has been put on hold. This article also explains the history of this concession. Ooops!!! Somehow I just knew it'd get fun. Thanks for the link. Rizzo Jasso is a pretty sharp dude, I have no doubts he will get the municipal permits to continue his project. Probably tried to avoid "concession fees" for the permisos. Rizzo Jasso is saying that the Urban Development Department doesn't have jurisdiction because the Port Authority does and he has his permission from them. Although the Urban Devlopment guy wants to see it. This is the way it was when the Tequila Repubic building went up. Wasn't part of the argument back then that the money and taxes generated by the business doesn't count for here but goes to some federal office. I wasn't really paying that much attention then, not that I am now either. It's gonna be what it's gonna be. Let's hope it is worthy of the location. Article says he was just changing the facade and not really remodeling.